At last we have a proper guitar-dedicated page. But you won't find here reviews about the ubiquitous Les Pauls, Stratocasters and Teles. I truly love these instruments but a lot has been said about them and I would rather leave it to others to keep on talking about these classics. 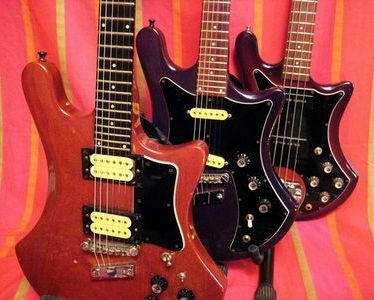 If the Guild S series was famous, it would be for its SG shaped S100, also named Polara, and its little sister the S90. The guitars we have here are from the darker side of this range, comprising the S60, S65, S70, and S300, along with their wood and pickup variants. The bass equivalent was the B series which included the B301, B302, B401 and B402, again with wood variations. The flagship of the guitar series produced between 1979 and 1983 was the S300. It was declined in four different models identified by the suffixes applied to the model names (as with most of the guitars of the series). An A indicates an ash body and a D was for Di Marzio pickups. The fretboard is always mahogany except for the S300 which employs tight grained ebony. Frets are typically large and low profile. Nevertheless, they allow big bends without choking anywhere on the neck. All the models employ the unique Guild parallelogram tail-piece and a 3-way adjustable type of tune-o-matic. The guitar has an SG type construction with a set-neck and a slim body which shape is shared by the bass version. The lacquer is very thin and can be damaged easily, but it is perfectly finished and gives the guitars the upper class feel they deserve. Model numbers indicate different pickup configurations. In its standard appointments, the S300 came with a one-piece mahogany body, 2 Guild humbuckers and a Les Paul-like array of controls. It was also fitted with a 70's approved phase reversal mini-switch which gave the usual nasal and funky sound with both pickups on. The S300D (left, front row in the main picture) features a DiMarzio Distortion at the bridge and a PAF at the neck. The main difference with its ash counterpart on the right is that it is very light. 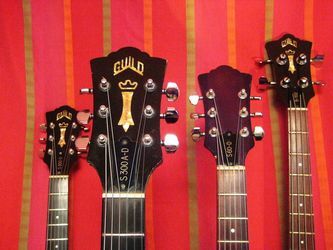 Guild knew how to choose its mahogany, while the two-piece ash body is paradoxically always very heavy. The S300AD has a three-piece neck with a mahogany middle stripe while the S300D has a one-piece neck. Both guitars sounds are reminiscent of a good SG, with a larger sound spectrum for the ash version (more highs and lows, less midrange focus). As with all good guitars, you can convincingly play in any style with them, from jazz to heavy metal. The S60D (left, back row) was one of the two single coils versions. It employs two high-output DiMarzios SDS-1 on a very large scratchplate, while the S70D has three. The 60 features a 3-way toggle switch and the 70 has a strat-style 5 position lever and a phse reversal switch. The placement of the volume and tone controls varies over the years: in line or in a triangle. Also, despite what the Guild catalogue says, this S60D has a master volume and two tone knobs. 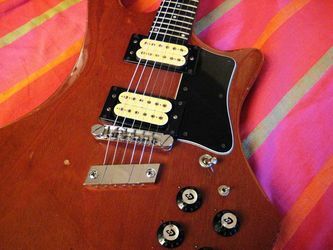 Ash or Guild-pickups versions don't seem to exist but who knows? This guitar has a different feel than its bigger brothers probably due to the mahogany fretboard. The SDS-1 pickups are also dark sounding and over-powering for single coils, but their yellow hue does look good with the rest of the guitar. It has to be noted that some S60 are in fact S65 despite what their truss-rod cover says. This last guitar model is the single humbucker version, also available in D version with a Di Marzio distortion. It features a volume and a tone control, along with a coil-split switch. This was the "Junior" version of the range. A 3/4 model of this guitar was also produced. The Bass version was available in a one pickup (B301), or two-pickup (B302) version. There was an ash body version (A suffix), and a fretless version (F suffix). The Guild pickups feature two poles per string and sound round and punchy. The tone is reminiscent of a Jazz Bass but it also has an active quality with deep lows and present highs. Simon Gallup of The Cure fame played a B301 in the early years of the band. The neck heaviness of the bass may explain why such a great sounding instrument hasn't been employed by more high profile musicians. Lastly, the B400 is the active version of the range and it is also the rarest. The S series is an incongruous proposal from a brand mostly associated with acoustics and jaz boxes. But it really is a 1970's treasure with fantastic craftsmanship, playablity, and tone. 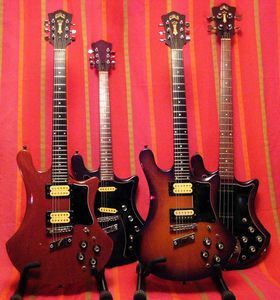 Surprisingly, the S guitars are not so scarce in Europe and regularly pop-up on Ebay. They constitute some of the last true bargains of the crazy and so-called "vintage" guitar market. The Vista series was one of Fender's attempts to introduce new designs to the guitar market in 1996/97. It offered four models: the Supersonic seen here, the Jagmaster which came back in 2002, the Venus and its 12-string version, the Venus XII. These guitars offered new if not daring designs and were all produced by Fender Japan. While the instruments were pretty good and their looks generally well accepted, the Vista range only lasted about a year. The Supersonic model we have here was offered in four colors: white, black, blue sparkle and silver sparkle. The light body is made of basswood and the neck has a 24" scale, equivalent to that of a Mustang. As with many Japanese Fenders, it is fairly shallow with a D profile, and the frets are narrow vintage types. It attaches to the body thanks to a trapezoidal recessed plate (very un-Fender). Controls are down to two volume pots with Jazz Bass-like knobs. The overall quality is high with a good attention to detail, especially considering the low price they went for and the Squier tag. The Supersonic is easy to play thanks to its short scale and hangs in a very natural position on the guitarist's shoulder. 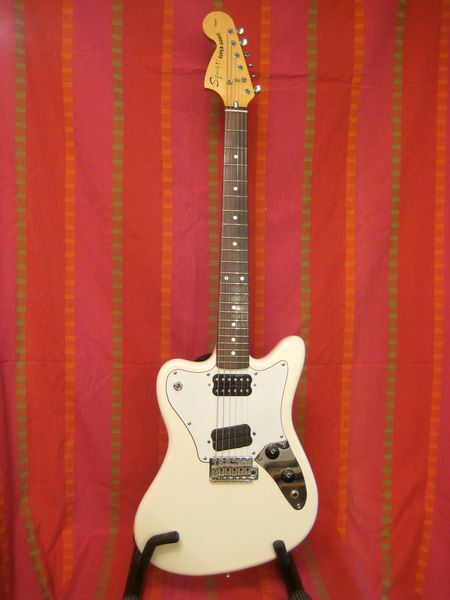 According to Squier's product manager of the time, the shape was inspired by a picture of Hendrix playing a right-hand Jaguar. While the guitar plays great, it is let down by its electronics. The pick-up selector is cheap and wobbly, and the original humbuckers are high output mushy units. Despite what Wikipedia says, they were not Duncan designed by any mean (the writers may be confused with the Venus XII split pick-ups which were true Seymour Duncan units). Of course, swapping them for quality pups is fairly easy and if you do so, you end up with a great little guitar that works well for rythm and lead. While the Vista series didn't last, it managed to grab the attention of a few famous guitarists, namely Omar Rodríguez-López (At the Drive-In) and Ace (Skunk Anansie) for the Supersonic, Crispian Mills (Kula Shaker) for the Venus XII, and Courtney Love for the Venus (the guitar was designed for her). Not bad for a forgotten guitar range!